Using myself as the central figure I portray the working situation of an artist who is caught up in a continual feedback loop. Using a video camera and computer the artist produces an interactive object which deals with its own “making of”, i.e. with the process of its own creation. I filmed myself carrying out everyday activities such as eating, sleeping and working (filming and saving, editing and “linking” the videos) in a motel room. To “link” the video material I developed the computer program “Two-Way-Movie-Linker”, which is used as the software player in the video sculpture “Motel”. Each scene was filmed twice: once wearing a motorbike suit and helmet, gloves etc. and once “normal”. The video sequences were produced in a non-public performance resulting in two videos in which the characters do the same thing. The player software is programmed so that the videos are intercut: an editing technique whereby the resultant film sequence is created from the juxtaposition of two different actions. At the conclusion of each sequence a menu appears: the viewer can choose the next sequence from several stills which appear on the display. The montage style of editing brings the two characters into dialogue, they appear to inhabit the anonymous space collectively. Over and above this the “Two-Way-Movie-Linker” software generates descriptive terms such as fitness, nutrition and hygiene. According to the particular needs of the protagonist determined by the software from an analysis of the recently selected sequences the player is offered a choice of appropriate following sequences. 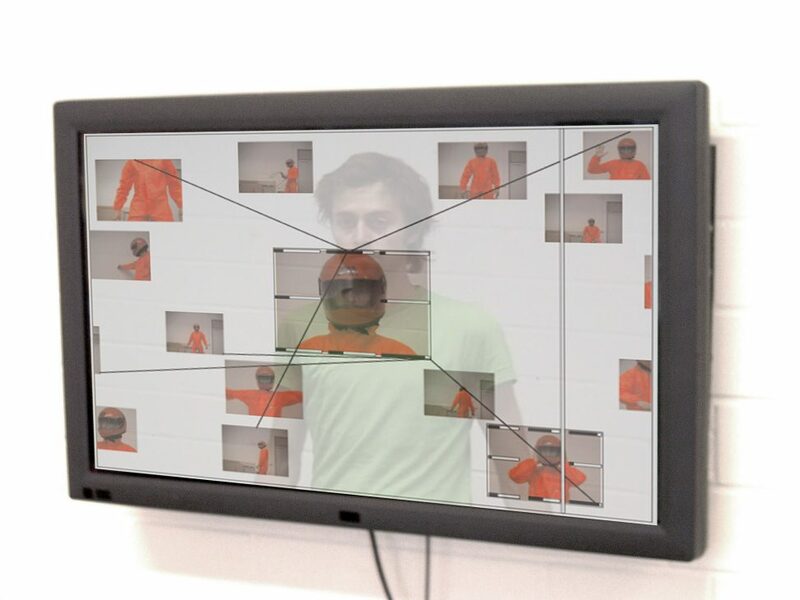 As a result of this process, a network structure is generated which shows interconnections between the various still images, and which appears as a transparent layer over the video images. Using the principle of film montage the player implemented in the work “Motel” puts together an infinite number of films from a finite pool of sequences. The course of the story line is determined by the interplay between a predetermined structure (the set of rules for “linking”), chance (independent motion of the clips), a memory (frequently viewed videos are pushed to the outside) and the viewer (with his/her decisions). 72 videos ranging from 20 seconds to 2 minutes in length are played in the program TWML (Two-Way-Movie-Linker). Programmed with Macromedia Director.